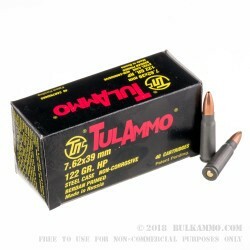 This 7.62x39mm ammunition serves well in both hunting and target shooting roles. It fires a 122 grain bimetal jacketed hollow point that delivers deadly mushrooming and can turn your AK or SKS into a competent deer rifle! Each bullet comes in a box of 40. 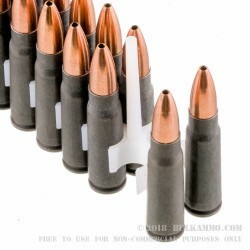 These cartridges are made in Tula, Russia using non-corrosive Berdan primers and non-reloadable steel cases. 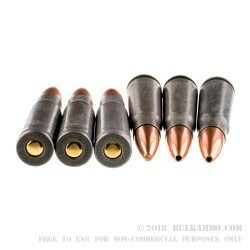 Steel cases are a particularly good choice for calibers like the 7.62x39 since they were what Russian weapons like the AK or SKS were designed to use. Like most new production steel, these cases have polymer coatings for more reliable cycling. 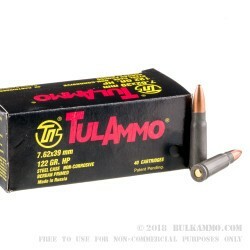 This ammo has magnetic properties due to its steel components, so it may not be allowed at some indoor ranges.